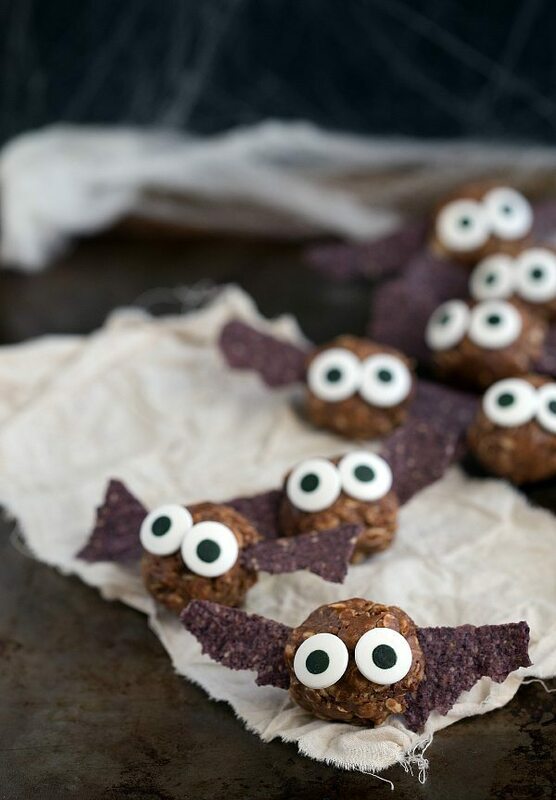 A healthy snack for Halloween – chocolate energy bites dressed up like a bat! Ummmm are you dying from the cute? After I finished making these bats I just couldn’t stop smiling cause they are so.dang.cute. BONUS. They are a healthy Halloween treat. Which, there aren’t too many healthy Halloween treats since pretty much the whole point of the day is to collect all the candy. Although, I always liked the costuming party wayyy better than the candy; dressing up is my favorite! And as a little girl, my mom would make all of our costumes. I have no idea how she did it, since trying to make 3 stockings for Christmas last year about did me in. They never made it on the mantle because they were that bad. Fact, I seriously cannot sew. As much as I wish I could and keep thinking that I can, everything I sew tends to end up as a total and miserable failure. So I’ll stick to making little bats in the form of energy bites and leave the sewing to the more talented folk. Yeah, as much as I was dying over how adorable these bats turned out, it is no comparison to the cuteness of this little guy!! The husband and I scored this costume for a sweet deal a few days ago and I have seriously dressed him up in it everyday for at least an hour cause I can’t get over how cute he is in it. And watching him crawl around with the stuffed lobster belly, yeah I get a huge kick out of it. And he seems to love the costume too! Plus my sister in law gave us a great idea to tie the whole family together with this costume. She suggested that we both dress up like Chefs! I’m too excited about this idea. The hubs and I in aprons and chef hats holding this little guy in a huge stockpot? Can it be Halloween already?! When I told this idea to the hubs he had an even better idea. He said, “How about you be the chef and I could have a huge lobster bib (the ones you get at a restaurant) + lobster-eating utensils. Then we got a big laugh over the fact that I would be “cooking our baby and he would be eating our baby.” Oh costumes! Anyways, back to these little bats. Because I could talk about my baby and his lobster costume for days probably. So I’m stopping now! 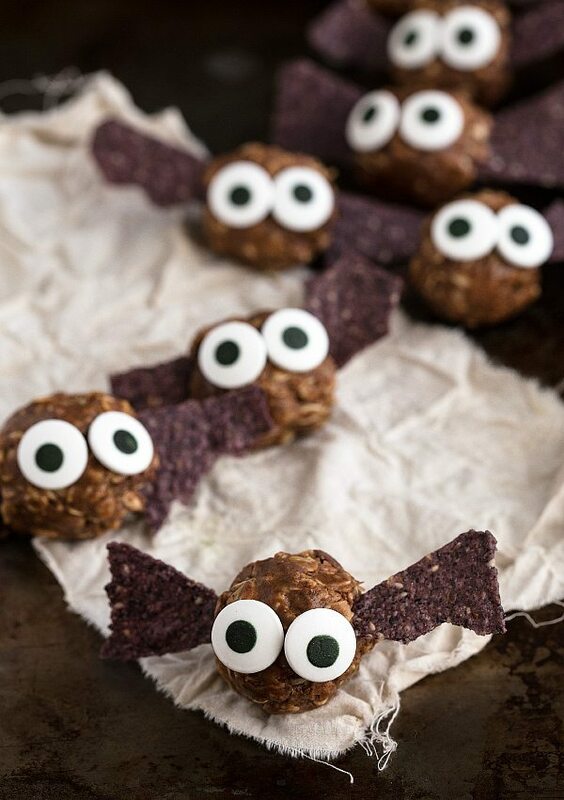 These bats are healthy “chocolate” energy bites with dark blue tortilla chips sticking out. Before you get scared about trying to break tortilla chips to look like wings, I didn’t even have to break any of these chips!! Near the end of the bag, there were lots of broken chips that just looked like bat wings. I guess that could have been a super lucky bag, but chances are most chip bags have lots of broken “bat wings” in the bottom of them. Well, that last sentence sounded a little weird. Especially if you read it out of context…. Bahahaha! In a medium-sized bowl, combine the peanut butter, honey, vanilla, and salt. Microwave for 15-20 seconds and stir until combined. In that same bowl, add in the oats and rice krispie cereal. Stir together until completely combined. Add in the pudding mix (my little guy doesn't love the taste of cocoa powder, so I use pudding mix or dry brownie mix, but those aren't as healthy as cocoa powder) or cocoa powder. Add in the chocolate chips if desired. Form a ball with the mixture around the broken tortilla chips (helps them hold their place). Then using a drop of honey, attach the eyes to the front. Store these bats in an airtight container for 4-5 days (I keep mine in the fridge). Those bats are so cute!!! I love that idea. That would be so perfect for a halloween party! Aww, that’s the cutest lobster I’ve ever seen! I am dying over the cuteness of pretty much this entire post. The bats are adorable, and the lobster….I can’t. Just the cutest little guy EVER. Hope you guys are having a great weekend! These are too darn cute, Chelsea! And they contain some of my favorite ingredients, too! The cuteness is absolutely killing me. I was already “awwwww”-ing over how cute the bats were, but then I saw your little guy and it was all over. You’re seriously making me want to throw a Halloween party -just- so I can serve treats like this! I always wish I can sew, then I remember that it’s a lost cause. Cute food is so much better (and cuter) anyway!! What cute bats! And an even cuter lobster!! OMG – your baby is the freaking cutest thing EVER!!!! SO MUCH CUTENESS IN ONE POST! and of course-these bats! They’re the cutest bats I’ve ever seen! And they’re healthy! and tasty! hurrah! 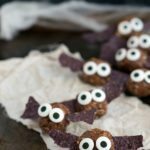 What a wonderful Idea for a healthy halloween treat and what a wonderful blog I have discovered today! Love these great Halloween food ideas! Pinned! These are fresh new ideas I haven’t yet seen. Looking forward to trying them out this Halloween.